Washington Blue Lion sophomore Richard Burns Jr. drives toward the basket and around Wilmington junior Chris Wolary during an SCOL game at Washington High School Friday, Feb. 10, 2017. Burns led the Blue Lions with 14 points. It was Senior Night at Washington High School Friday as the Blue Lions welcomed the Hurricane from Wilmington High School. Despite a tremendous effort, the Blue Lions fell to the ‘Cane, 51-45. Wilmington improves to 10-3 in the SCOL, 12-8 overall. Washington falls to 5-8 in the SCOL, 7-12 overall. Wilmington junior Dylan Beaugard was the game’s leading scorer with 21 points. He hit two three-point field goals and was 7 of 8 from the free throw line. Junior Matthew Smith was also in double figures for the Hurricane with 14 points. He converted three three-point baskets. 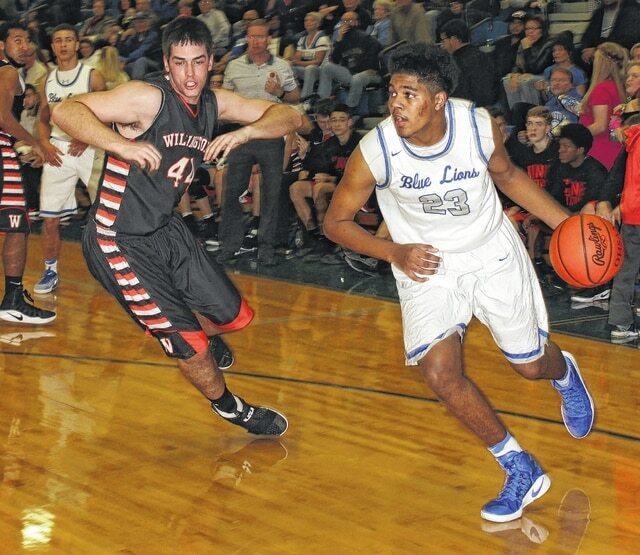 For the Blue Lions, sophomore Richard Burns Jr. led the way with 14 points. Senior Jarett Patton scored 11, including three three-point field goals and senior Kory Proby scored nine points. It was a very slow and deliberate start to the game for both teams. Patton hit a two-point basket and then a three-pointer to give the Blue Lions a 5-0 lead. Wilmington missed their first four field goal attempts of the game. In a matter of moments, the Hurricane had tied the game, 5-5. Burns hit a basket with 50 seconds to play in the first quarter, the final score of the initial period, to make it 7-5. In the second quarter, Washington went on a bit of a run, taking a 21-14 lead with under four minutes remaining in the first half. By the end of the half, Washington was in front, 25-20. Wilmington fought back and was able to tie the game, 29-29, with 4:24 to play in the third quarter on a basket by Chris Wolary. The lead changed hands a couple of times as the third quarter waned. The Blue Lions had what proved to be their final lead of the game, 37-36, on a three by Dillon Steward with 1:20 to play in the third. After three complete, Wilmington led Washington, 39-37. Washington tied the game to start the fourth quarter on a basket from Kenny Upthegrove. Wilmington regained the lead and held it the rest of the way. “We had a stretch there where we were kind of playing off of (them),” Washington head coach Shannon Bartruff said. “They made a couple of shots and we had a couple of defensive lapses and some untimely turnovers. “Wilmington does that to you a little bit,” Bartruff said. “A little bit of it was us, just not being composed. We got stops, we got rebounds and we were pushing it in transition and we would turn it over in transition. “We had some kids sick and banged up tonight,” Bartruff said. “But I thought the kids battled. Bartruff spoke about his four seniors. “All four of our seniors have been a part of our program since they were in sixth grade, or seventh grade,” Bartruff said. “Obviously, losing Griff (Griffin Shaw) it hurts us in more ways than one. It hurts our confidence at times; it hurts us spreading the floor. He was a leading scorer, one of our top rebounders. “Kenny’s been great for us all year,” Bartruff said. “He’s been solid, steady. We usually put him on the other team’s best offensive player. He’s one of our leading rebounders. “Jarett is a gritty, gutty competitor,” Bartruff said. “He can shoot it, he can get hot. He’s one of our leading rebounders. “We’ve struggled some this year, offensively,” Mike Noszka said. “I think we’re getting better. I really credit our kids with the type of toughness they play with and just following our game plan. “In the second half, we made a couple of adjustments on the Patton kid,” Noszka said. “We wanted to pressure them a lot in the first half and we were going to leave Patton open and see how he would shoot it and sure enough, we didn’t rotate to him. “We make things difficult for ourselves, missing lay-ups and free throws,” Noszka said. “Those things have to improve going into the tournament. The good thing is, we’re battle-tested. We’ve had a lot of close games and we’re starting to win these close games. Washington will be at Unioto tonight at 6 p.m.
Wilmington will be at home Friday, Feb. 17 against Chillicothe. WASHINGTON — Dillon Steward 1 (1)-0-5; Jarett Patton 1 (3)-0-11; Evan Upthegrove 2-0-4; Kory Proby 4-1-9; Kenny Upthegrove 1-0-2; Blaise Tayese 0-0-0; Richard Burns Jr. 6-2-14. TOTALS — 15 (4)-3-45. Free throw shooting: 3 of 4 for 75. Three-point field goals: Patton, 3; Steward. Combined field goal shooting: 19 of 42 for 45 percent. Turnovers: 12. WILMINGTON — Curtis Gauche 1-0-2; Layne Griffith 0 (1)-0-3; Alex Wright 0-0-0; Matthew Smith 2 (3)-1-14; Dylan Beaugard 4 (2)-7-21; Colt Smith 0-0-0; Jeffrey Mansfield 2-1-5; Chris Wolary 3-0-6. TOTALS — 12 (6)-9-51. Free throw shooting: 9 of 16 for 56 percent. Combined field goal shooting: 18 of 43 for 42 percent. Turnovers: 8.